Tony Leung Siu Hung's action directing presence is more widespread than his directing. He's never really made a homerun but Thunderclap (Shaw Brother's production) and this action/horror hybrid are quoted as the memorable entries in Tony's filmography. Big budget was not something a lot of Hong Kong productions were blessed with back in 1993 and that is also applicable to this movie. Despite that, Vendetta packs quite a punch. A low budget but a serious film can, when it comes to Hong Kong cinema, result in unintentional fun. Tony Leung still takes on the challenge of making a tense horror movie that has not only one but several nods to other classics of the genre like The Omen (and to a certain extent even The Silence Of The Lambs). Tony engages the fastest possible gear in terms of storytelling which proves to work for and against him. Before venturing into the horror part, Tony shoots and choreographs a fair bit of gritty action via our three super-evil villains. It certainly feels like someone has been watching their share of Ringo Lam movies but Tony nonetheless gives us decent stunts and hard hitting action. In between this he actually finds the time to establish lead characters such as David and Ming (Kent Cheng) without sacrificing the pace. Also, in particular during this opening, the camera work and editing surprises. The fast and furious nature of Vendetta only works until the horror themes take over. Tony's tempo, when trying to scare us, works against him because it's simply too fast. The best horror comes out of stillness and that is what Tony should've employed here. Eventually Tony finds a better rhythm and manages to inject a good amount of creepiness in the atmosphere around the family. There are a few good examples in recent years but Hong Kong cinema have never been good at showcasing serious horror elements. Tony's attempt however is very ambitious and works in parts. Where it doesn't is where Vendetta falls victim to the almost unavoidable clichés of the genre but he does deserves a big kudos for pulling off what he does. Especially his directing of the two kids works wonderfully in some scenes. They got that creepy innocence that in actuality is pure evil. Vendetta has a fair amount of gore that, for it's time, should be considered executed well. Make-up is pretty effective in some of David's visions but it's works largely because of other movie elements are in sync with another (such as editing and sound design). We rarely see a lot of effects done on camera, which in this movie proves to be even more effective, but sometimes the aftermath can't hide the low budget nature of the film. Even looks like Tony had some of the old 70s Hong Kong cinema blood stashed away. The screenplay (co-written by the prolific Vincent Kok) doesn't come with surprises in the character department but a trio of recognizable faces makes it work without turning it into unintentional comedy. Ray Lui displays devotion to this role but has shown better charisma in other movies. 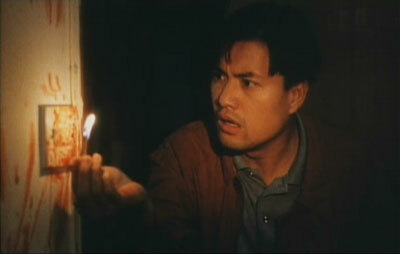 Ringo Lam-regular Tommy Wong takes the lack of layered characterarc and goes all out with the menace part of Hung. He does succeed actually and convinces us that he's a seriously whacked out psycho. Well done, Tommy boy! Finally, Kent Cheng has a solid supporting role as David's superstitious partner and best friend. Comedy enters the movie through Kent but it's much better in tune with the movie than I expected. Usually the horror and comedy are pure contrasts in a Hong Kong movie but it definitely is a welcome addition here. So many movies feel the need to break up a dark movie with broad comedy but with Vendetta, director Tony Leung proves you can achieve good results by not doing so. A rewarding experience that should be applauded for trying, even if it doesn't fully satisfy. This Widesight disc is actually one of their better looking ones. It's not quite framed at 1.85:1 but the burned in subtitles never get cut off at the sides. It has good colours, very little specks but is a bit soft. Sounds comes in Cantonese and Mandarin Dolby Digital 5.1. I didn't listen to the latter but the Cantonese track was so poorly mixed that the dialogue was mostly heard in the surrounds speakers! I ended up connecting the sound to my TV instead where it sounded much better. Inexcusable but at least the track has no added foley effect like other companies 5.1 remixes. The English subtitles are burned in and features quite a bit of silly errors and inaccuracies. They tend to slip below the letterbox frame on occasions which of course is a distraction. Could still follow what was going on during those times though. Only a plot synopsis screen is provided i.e. no real extras.